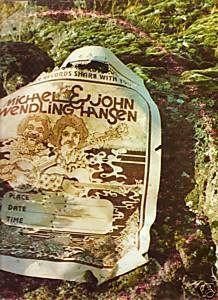 Sheepeater SR000-5 vinyl LP (1979) Michael Wendling John Hansen guitars, banjo, vocals Panhandler/Got the Blues/Doc's Rag/Southbound (wr. by Doc Watson)/Rhythm and Blues//Arrowhead/Ballad to Lorraine/Born to Be With You/Stealing/Fisherman(wr. by Leo Kottke)/How Many Times/Snake River Slide Record is VG excellent; cover has ringwear.